State Assemblymen Karim Camara and Ron Kim said they want admission to elite high schools to depend on more than the score on a single test. FINANCIAL DISTRICT — The teachers union and state lawmakers are pushing to overhaul admissions at the city's top public high schools, calling the lack of racial diversity at the schools "an embarrassment." In an effort to increase the enrollment of black and Hispanic students at Stuyvesant High School, Bronx Science, Brooklyn Tech and five other elite schools, a new state bill, backed by the United Federation of Teachers, seeks to broaden the admissions criteria beyond the current single test that determines which eighth-graders win admission. Only seven of the 952 students admitted last fall to Stuyvesant High School were black — and just 21 were Latino, officials said. 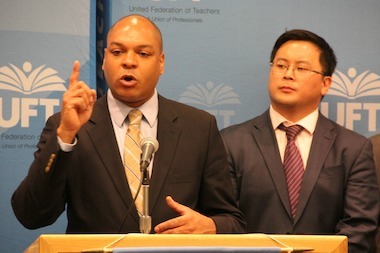 "What a child does over their entire educational career is just as important — and as a teacher, I would make the argument more important — than their performance on a single day's test exam," UFT President Michael Mulgrew said Monday at a press conference announcing the legislation, which would allow the schools to also consider metrics like a student's attendance records, grade point average and state test scores. Across the city, just 4 percent of black students and 5 percent of Latino students who took the city's Specialized High School Admissions Test were offered spots at one of the eight specialized high schools, compared to 28 percent of white students and 33 percent of Asian students who took the test, officials said. The DOE praised the bill, saying in a statement on Monday that it "represents a real opportunity to attract excellence and achieve a more diverse student body in our city's specialized high schools." Mayor Bill de Blasio previously said in March that he supports changing the single-test admissions policy. State law currently dictates that Stuyvesant, Bronx Science and Brooklyn Tech base their admissions on a single test, and the other five specialized high schools have traditionally followed suit. The city cannot change the admissions process for the specialized schools without a change in state law. State Sen. Adriano Espaillat, the bill's co-sponsor, said the current admissions test is weighted toward those who can afford to spend time and money preparing for it. "If you don't have the dollars to take these very important [test prep] courses, than you won't be able to get in," Espaillat said. Espaillat said that he preferred broader "portfolio applications" to test-based admissions, and Mulgrew suggested that the Department of Education consider students' projects and volunteer activities in making admissions decisions. Assemblyman Ron Kim added that schools should consider students' "non-cognitive skills," such as "grit and determination." The state legislation does not specify new admissions measures for the specialized high schools, but it would allow the Department of Education to determine them in the future, a UFT representative said. However, the bill faces some opposition, including from a group representing Brooklyn Tech alumni. Larry Cary, president of the Brooklyn Technical High School Alumni Foundation, released a statement Monday calling the legislation "seriously flawed" because it does not address ways the DOE could better prepare all students across the city for the current test, by improving outreach, providing tutoring and increasing the quality of middle schools. Cary also said there should be more public input on the bill. Espaillat and Assemblyman Karim Camara attempted similar legislation last year, but the bill did not get out of committee. This year, they say they have built broader support and hope to bring the bill to the floor for a vote.